One reason for population growth seems to be that something which could be called “sustaining a human” (whatever this encompasses) takes a lot of work. And it takes especially a lot of work to sustain not so efficient humans, like children or elderly people, but also humans who work in areas, where the benefit for mankind is not so clear etc.. By looking at this population growth it thus seems humans currently need more people and machines alone for the reasons to constantly increase their workforce. Note that this question of increase of the rate of needed workforce is of course linked to the question of economic growth. But is it really true that alone for “sustaining themselves” humans need to increase their human or nonhuman workforce? In the update of 21.10.2017 in the post Lobetal – In food chains I described, how my critisism about neglecting the (human) workforce in the calculations about whether 2000 m^2 of arable land is enough for sustaining one human, was not so well perceived. That is in particular in the post “Volt ohne Raum” a quick back of the enveloppe calculation showed that: doing all agricultural tasks by hand is likely very space and energy-inefficient. And hence – especially given that there are other energy sources which are currently way more faster and with less space need than solar- we have meanwhile a giant agriculture industry, which produces human food rather efficiently. A fact, which can be -last but not least- seen when comparing prices for self-produced and for industrialized food. So in short: Space and Energy-inefficiency seems to be not the last word when it comes to inefficiency, but it does play a big role. In fact growing crops by hand is so inefficient and expensive that I have problems to justify it to myself. That is I’ve been growing plants for all my adult life and my production has sofar more or less steadily increased from some flowers to a meanwhile about 50 m^2 fruit/veggie plantation plus some trees, which conflicts more and more with the rest of my duties and projects and my age. My plantation is of course quite expensive alone due to the fact that I currently have my “paddock” on potential appartment land in boomtown Berlin and since I didn’t inherit anything the soil comes with quite a mortgage. But it is also increasingly expensive not only in terms of labour for the mortgage but also in terms of pure labour for the outcome. That is I sofar use very few machinery (a lawn mower, a shredder, a chain saw and transport by car) and yes with increasing age you increasingly notice that you have just shuffled a ton of compost. Tim or the kids have done something once in a while, but it is basically me alone. So what is it that I currently think produces most of the work ? Did I find some solutions to the corresponding problem? 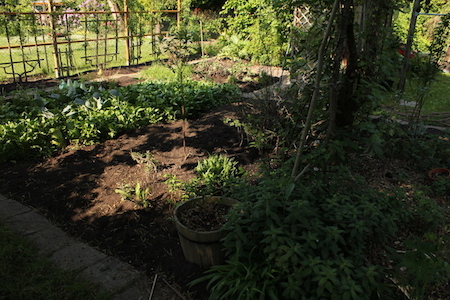 Keeping a garden in shape is in general more work intense the more diverse and the more you want to harvest something. That is a lawn with some easy bushes can rather easily be kept in shape – especially with a lawn robot. Likewise if you have a wall around your garden and big trees are no problem – you may just let grow. 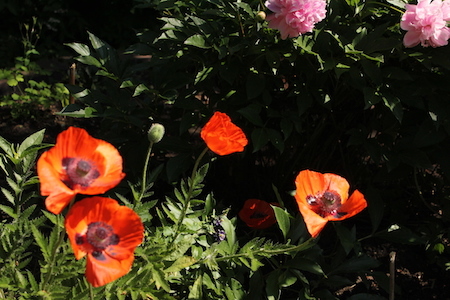 But if you want/need to harvest – then things get more difficult. And by harvesting I would like to include “harvesting beauty” that is people put a great effort into shaping their garden in order to make it look “great”. For the case of harvesting it is rather well-known that keeping low diversity may give you high gains on a short term because sowing and harvesting is easier. Maintaining low diversity gets though harder by repetative application, because monoculture is easier invaded, moreover soil ressources are faster expleted if crops are non-complimentary. High diversity though means – it may be hard to maintain and also hard to harvest. So finding the right proportions and structure is crucial. People use the word “mixture” here, but I don’t really like the word “mixture” in this (and similar) context, because the word doesn’t reflect how difficult it is to put the parts together. In fact its not only me who seems to disapprove the term but gardeners here use the e.g. 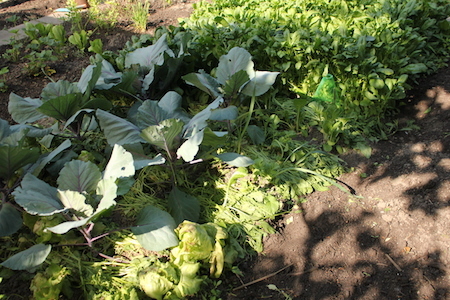 the word “mixed cultivation” or companion planting for a certain type of veggie/fruit planting which is an approach to higher diversity under the constraint of higher yields. I’ve been using one certain mixed cultivation approach since a couple of years on one bedding. It has been described by Hans Wagner in his book Mischkultur. I currently don’t have the book at hand, but if I remember correctly he learned this approach himself from some female acquaintance. At this place I would like to mention, that most of my gardening knowledge is by trial and error and some books – the open internet has been helpful on a couple of occasions but it is increasingly difficult to find profound information. In particular as said gardening is costly and yes there are some gardeners out there who are more “influencer” than real experts. Anyways back to the question: what were my biggest problems sofar to keep the garden in shape, while still having something to harvest? 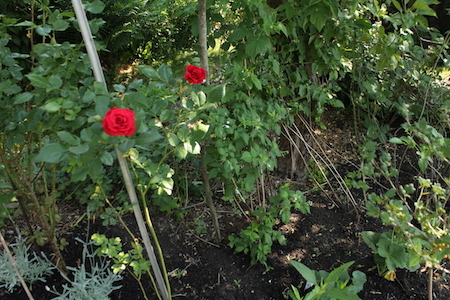 Since the garden contains a rather high diversity sofar pests and the like have been not such a big problem (maybe apart from slugs) as the need to keep some bushes and trees in shape (see randforms syringa post) and especially the need to keep the weeds in check. In the sequel I will report about partial “solutions” to the weed problem. 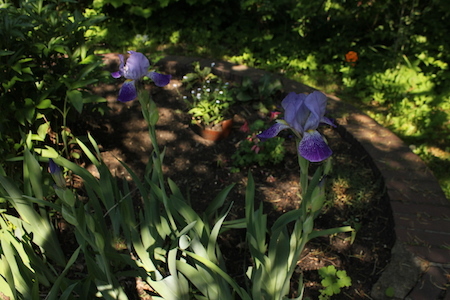 Weeding is nervy and rather work intensive, especially if you don’t want to use chemicals. Moreover things like flame weeding can backfire badly, so I used it sofar only on weeds between pavements. I was happy though that the specific “mixed cultivation” method from Wagners book worked out considerably well against weeds until about end of May. So it is at least somewhat a partial solution to the weed problem and I will thus report about it in the following passages and then in the images. So what is that wondermethod? Basically Wagner describes among others in his book that it is useful to sow spinach rows between the compagnion crops. The spinach is supposed to serve as a fertilizer plus it keeps the weed away plus it keeps the moisture in the soil plus it protects the fragile young crops during spring. The spinach rows should alternate with the crop rows every other year, so that the soil gets fertilized evenly. What were my experiences with that method? Rasberries, rubus and blueberries are here mulched with wood chips and compost, I will later add bark. In the front the bedding with the spinach rows, behind it the rasberries, rubus and blueberries with a bedding inbetween, which is now filled with potatoes and beans. 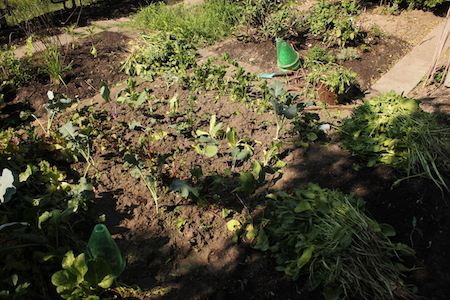 The spinach between the red cabbage has here been torn out and put as mulch in between. 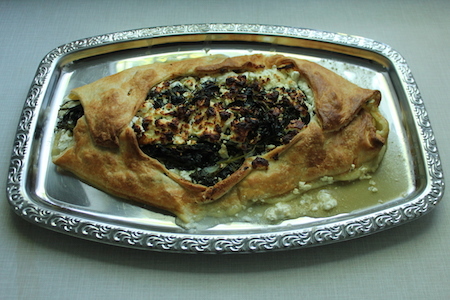 The spinach may not be sufficient as a fertilizer partly because partially it had been eaten. 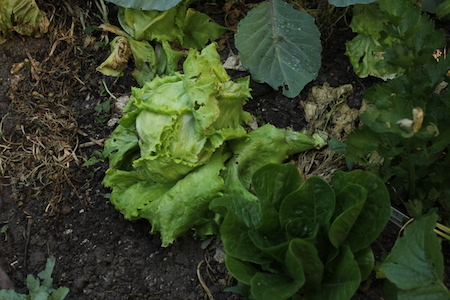 After a couple of days the spinach has shrinked and shriveled and has turned brown (here around the iceberg lettuce). As you can see there is not enough to cover all soil. The other rows with stem turnip, broccoli, two types of celery and beetroot and salads after the spinach has been torn out and the weed in between removed. 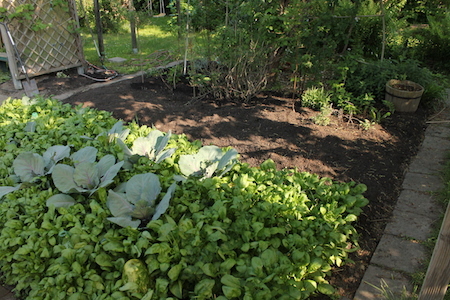 The same bedding as seen from the other side, with the piles of spinach put back as mulch. In some years I kept some spinach growing for harvesting seeds, but this reduces crop room and makes weeding a bit more laborious. So this year I was lazy and took down all the spinach. Spinach seeds are not cheap but affordable. 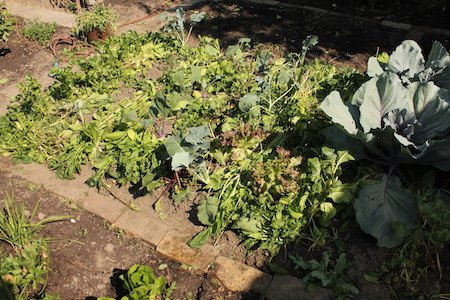 As said above the method works until end of May, after that the spinach mulch is not enough and I haven’t yet found a sufficiently satisfying approach for the rest of the year. Neither for mulching nor for weeding, which is partly due to the fact that the cut of the attached lawn is too infested with goutweed and couch grass. So maybe in an upcoming post I may report about experiments with the lawn peat moss. 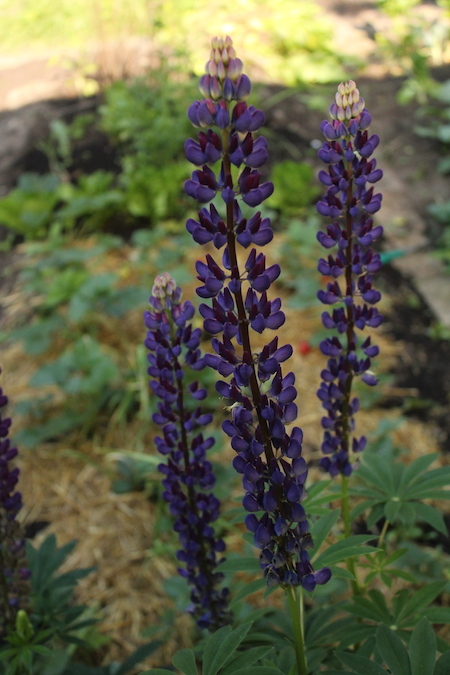 Blue lupin in front of strawberries.